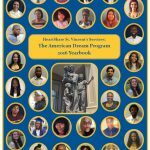 HeartShare St. Vincent’s Services (HSVS) released its American Dream Program Yearbook for the 2016-2017 academic year. Through its American Dream Program (ADP), HSVS demonstrates its commitment to ensuring that older youth leaving foster care get the support they need to achieve their dreams. Nationally, between 3-4 percent of youth in foster care graduate from college. Through ADP, scholars are equipped with college counseling, academic support, financial assistance and emotional support to beat those odds. The ADP program, established in 1997, continues to thrive. “We are proud to send off 50 scholars to college this Fall,” said Dawn Saffayeh, Executive Director of HeartShare St. Vincent’s Services. See the full ADP Yearbook here.. To learn more about the HSVS American Dream Program, visit www.hsvsnyc.org.